Double-click the survey that you wish to replace. Alternatively, right-click the survey and click Configure Survey. Click on the arrow at New Survey to reveal a list of surveys from a drop-down menu. If the desired survey file is not in the drop-down menu, click on the Select File icon to the right of New Survey. Select the new survey file that you want to use and click Open. Click OK to replace the survey. Note: If you attempt a redefinition using a file containing an equivalent survey, a validation message "No changes detected" will appear at the bottom and the OK button will be disabled. 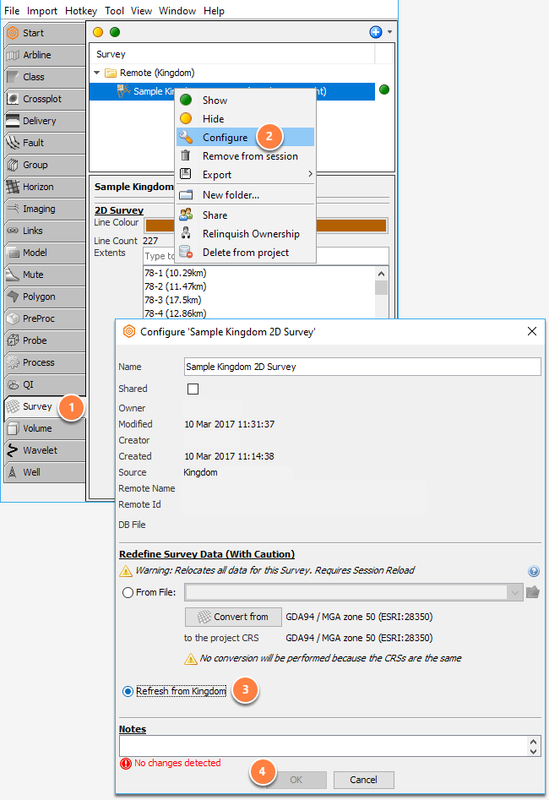 When a 2D line has been added to the Kingdom project that Insight hasn't seen before, you will need to refresh the 2D survey in Insight. Go to Control Panel and open the Survey tab. 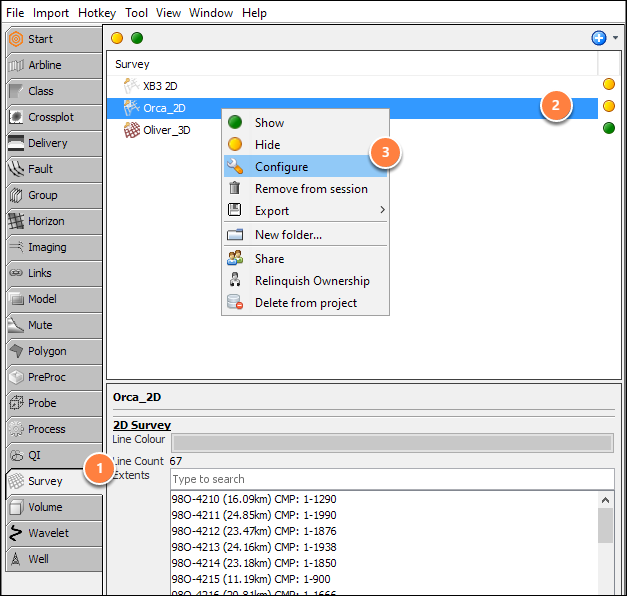 Right-click (or double-click) the imported survey and select Configure. Choose "Refresh from Kingdom" or "Refresh from Remote" (depending on your version). Note: A warning will appear if there is no new changes detected. This will update Insight's copy of the 2D survey geometry. 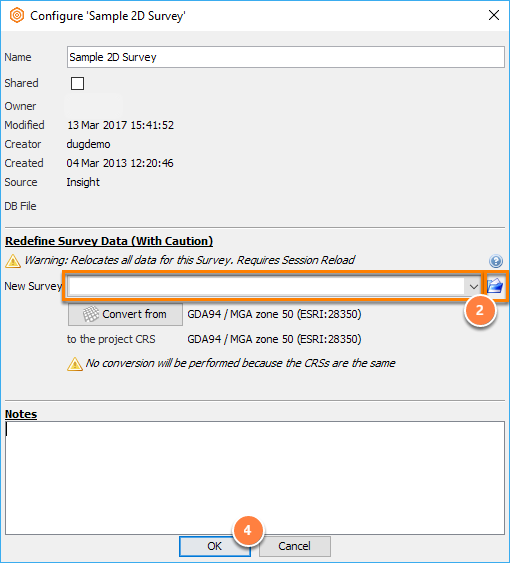 Once you have selected a new survey file, the Survey Updated window will appear to ask you to reload the session. If you decide not to replace the survey, click Continue to continue with the old survey definition. 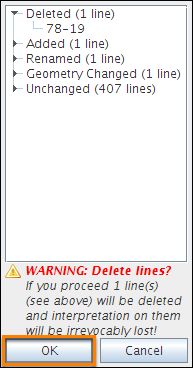 If redefining a survey would result in deleted lines, a separate warning dialog will appear to show you a breakdown of the affected lines. Click OK to proceed, or click Cancel to cancel redefining the survey. Note: Lines not included in the new survey geometry will be lost. Interpreted horizon data on the removed lines will also be removed. Consider creating a regrided copy of horizons in X/Y before replacing the 2D line geometry.